Place all ingredients (in batches) into blender and blend to desired consistency. Chill overnight. 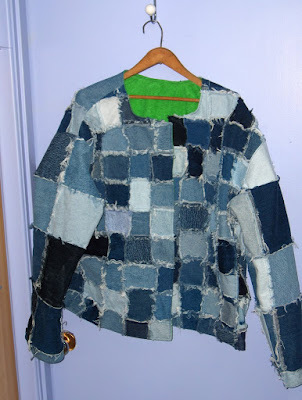 Further in my looking back series....some of you (most of you, probably) know that I have a 'thing' for working with recycled denim. These two jackets were ones that I made in 2006. The rag style was a one-off and was done for a commission. 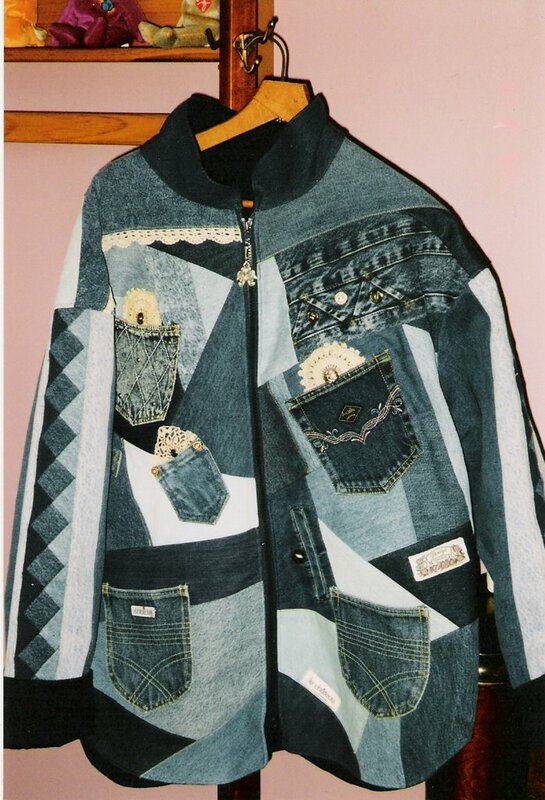 The jacket below was one over over 30 jackets I made in the crazy quilt style and using recycled denim, along with lace and recycled clothing labels. Alas, the arthritis in my hands has meant that I have had to pretty much give up my work with denim. It was certainly fun while it lasted though. Oh, and here's something you might find interesting... have a look HERE at Di van Niekerk's blog to find lots of free tutorials for silk ribbon embroidery. Today the quote is from Anonymous......"What you permit, you promote"
First of all, did you know that today is 'World Embroidery Day'? I didn't either, until I read a post from Judy HERE. What are you planning to do to celebrate the occasion? I, of course, will be working on the grand secret project! Please excuse the picture quality on this piece! I thought that you might like to see it though, despite the poor photo. This was my 2006 entry into 'The Quilt' (the breast cancer fundraiser). It measured 18x18" and was entitled "All I Want For Christmas"...."All I want for Christmas is an end to the disease that robs us of our mothers, sisters, grandmothers, daughters, friends and sometimes our men. Hopefully this small quilt will help." If you can see the snowman on the mid-left - it was one of my first forays into the use of waste canvas on my pieces. Irene made me this adorable little owl, created from an Ann Wood pattern. I promptly named her 'Hilda' and she will reside in my sewing room overlooking all I do. Sue is the queen of all things paper (which we like to tease her about), so she gave me these pretties to create with. I know these will be showing up on some of my atc creations in the future. by Sue and the bottom was mine. Today your quote is from Melissa Loruso....."We cannot change the direction of the wind but we sure can change the direction of our sails"
1. For those of you (like me) who suffer from sore hands, perhaps you might find the exercises that are suggested HERE to be helpful. I know it says they're for knitters, but I think anyone would benefit. 2. There's a free tutorial available HERE to make your own Japanese Knot Bag. Looks like it would be fun to try. 3. There's an interesting tutorial regarding an easier way to bind quilts and that can be found HERE. 4. Suzy of SuziqusThreadWorks has just announced that she will be teaching an online class to learn to make her 'Peaceful and Pondering' Fabric Lace Book/Journals. I've been a follower of Suzy's blog for a long time and I can attest that her work is absolutely gorgeous. I know her class will be just as amazing. Go HERE for further information. 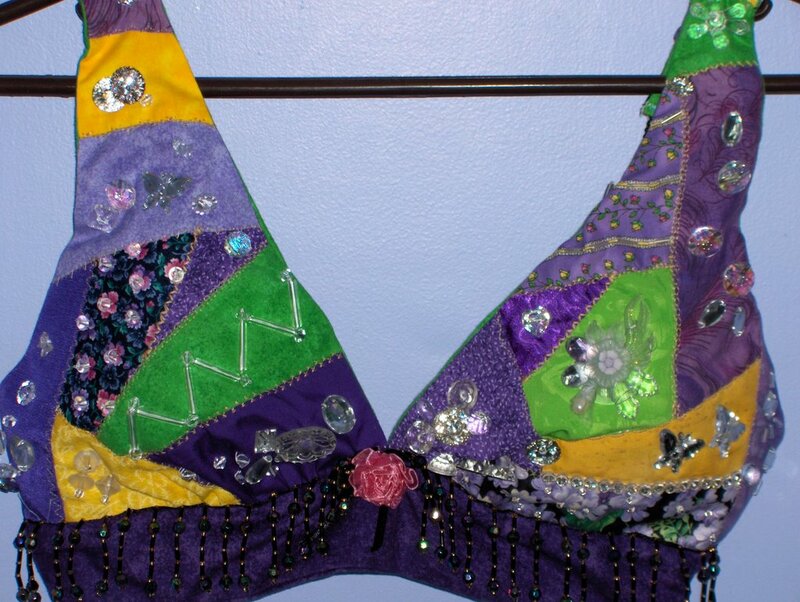 Further in the looking back series... in 2006 two of my friends and I decided we would like to create 'decorated' bras which were donated to a local breast cancer fundraiser. 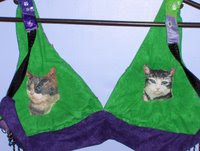 At the time we were members of our local quilt guild and we decided that we should cause a bit of a stir and actually model our decorated bras. Of course with the members being a mixed aged group of ladies we were met with a great deal of laughter and bit of condemnation as well. You have to realize that our meetings were held in a church and I suppose this sort of thing could have been frowned upon by some. Today the quote is from Dame Margot Fonteyn.... "The one important thing I've learned over the years is the difference between taking one's work seriously and one's self seriously. The first is imperative; the second is disastrous." I've been trying to think about what I might be able to post about so you can at least see something when you come for a visit. After seeing a post on Christine's blog showing a piece she had done several years ago I had an 'aha' moment and decided it might be fun to show a few of the things I've made over the years that you might have missed seeing. For those of you that remember all of this, feel free to hit the snooze alarm! 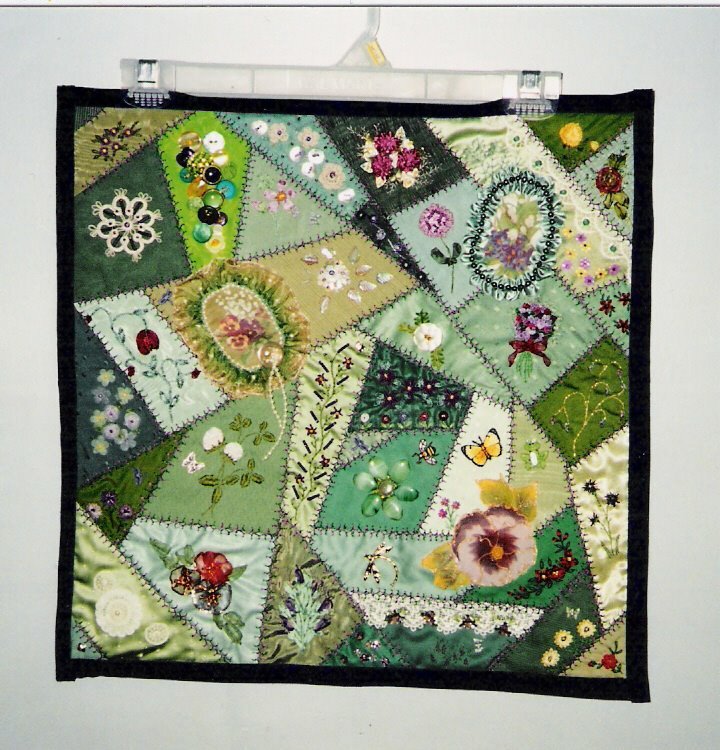 Back in 2005 I made a small wallhanging (17 x 17") that was entered into a breast cancer fundraiser called 'The Quilt'. This one was entitled "Hope - Is Eternal"
I didn't have a great camera back then, so the quality of the photo is probably not the best. There's no 'recipe' as such....Place washed raspberries in a glass bowl and cover with white vinegar. Let stand 24 hours. Make sure you put a tight cover on or you will have a bunch of drunken fruit flies!! Bring to boil and mash berries. Strain and measure the amount of liquid. Add an equal amount of sugar and return to boil. Simmer for 20 minutes. Place in sterilized jar(s). Refrigerate. Add some to either regular water or sparkling water and enjoy. (The directions aren't explicit as to ratio of water to juice, so you would have to experiment). Today the quote is from Melissa Accadia....."Just because you're handed a cactus doesn't mean you have to sit on it"
1. Kathy Shaw (Shawkl) has opened up registration for her ICQC (Intermediate Crazy Quilting Course) Module 102 - Working With Paints, Dyes and Inks. There is no prerequisite for this one. You will have to hurry though, because registration is only open from July 27 until midnight July 29. Go HERE. 2. Sandy of Quill Cottage Studio has posted a really great tutorial on making art journal pages HERE. Even if you don't have any plans to make any art journal pages anytime soon, it's worth seeing what she did! 3, Sharon B (of Pin Tangle) has posted about Ideas For Embroidering Crazy Quilt Seams and you can check that out HERE. 4. Sue (from Super Mom-No Cape!) 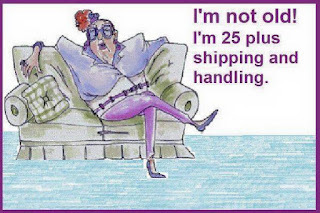 has a stitchery link-up party every Monday for anything that is embroidery related. She also posts a free embroidery pattern too. This is HERE (please consider linking up because it's fun to see what everyone is working on). 5. AND - it's only a few days until the latest edition of the 'CRAZY QUILT QUARTERLY' magazine will be available. I have an advance copy in my hot little hands and it's the best one yet! There's all sorts of fun fall-related content and great articles and how to's. I will let you know when it's available and how to get your copy. Oh yes - and we're currently looking for winter themed articles, projects, and eye candy - please do send in your work. We really DO want to see it!! You can go HERE for submission guidelines. Remember the rhubarb recipe I posted the other day? Well, I have to say it's good made with cranberries too. AND try replacing the graham crumb crust with chocolate crumbs...use cherries....and chocolate pudding on top. Now, I wouldn't know WHY any of those options would be good. Nope, not moi. 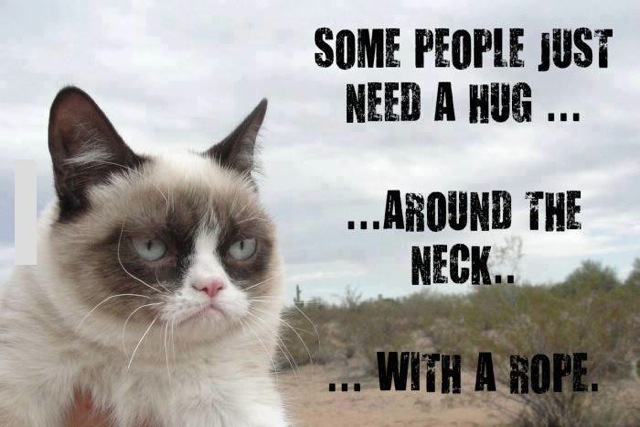 I don't know about you, but I've been seeing images of the Grumpy Cat all over the internet. This one caught my eye and made me laugh. Today the quote is from Dave McIntyre....."Appreciation is like an insurance policy. It has to be renewed every now and then"
See you when I recover. The work continues on my secret crazy quilt project and how I wish I could share with you what I'm doing! I really like it and I'm excited about it, but I can't share.....yet. This will be added to the leftover pieces from the Quilt-zzz to make a double-sized quilt (I think). The fabric on the right will be the backing and the tiny flowers will be combined with the white offcuts for the front. Hopefully it will look okay! I ordered the fabric online from HERE and I can highly recommend the service and just plain 'niceness' that Bebe (the owner) shows. Now, about the poundage (of the around the hips sort), here's a recipe that we've recently discovered and have already made several times. Hmmm.....do you think perhaps we like it? Combine and cook until thickened, stirring constantly. Let cool, and spread over prepared crust. Quite obviously I have nothing to show you in the way of creativity, altho' I HAVE been working on a couple of projects. One is a secret for now, but you will see it in time. The other is to create a bag for a head. A head, you say? Yes, a head. Believe me, this thing is massive. It's part of a human sized 'Furry' costume and I've been commissioned to make some sort of carrying bag for it. Not an easy chore I might add!! So, for lack of anything better to show you, how about some more 'bits and bobs' from about the web? 1. Pam Kellogg has put out the call for items for publication in the Winter issue of the Crazy Quilt Gatherings magazine and here's what she has to say... "I'm currently looking for Winter scenes, christmas projects, snowmen, snowflakes, whites, blues, mint greens" Please do consider sending her any photos, articles, how to's for the magazine. Remember - the magazine is only as good as you help us make it, so don't be shy. Share your work....let us see.....we really want to!!! Go HERE for further information regarding making submissions. 3. Sharon Boggon has announced a new TAST challenge HERE. If you are familiar with, or have heard of her very popular 'Take A Stitch Tuesday' series, you might want to check this out, particularly if you would like to expand or improve on your embroidery skills. I played along with her original challenge several years ago and I learned SO much! If you want to learn more about what exactly is involved in the TAST, there's a link at the bottom of her post to take you to that. 4. For the crocheters among you, perhaps you'd like to play with popsicle sticks and crochet. Go HERE to check that out! 5. Pat Winter has released a couple of new patterns via her blog that you might like to check out. Go HERE for her publication re using shibori ribbon to create a butterfly and HERE for her sewing kit project. 6. There's some fun happening over at Val's Quilting Studio - she's taking sign-ups for her third year-long piggy bank savings challenge. The premise is to save all the loose change you find for a year and at the end of that time count it up and then go buy yourself something fun. Go HERE to find out more! (Thanks Renee for the heads up about this one). Today the quote is from John Ruskin.... "The highest reward for a man's toil is not what he gets for it, but what he becomes by it"
1. Kathy Shaw has announced registration is open for her Intermediate Designing and Piecing Crazy Quilt Blocks class (you must have completed her BCQC Beginners course as a pre-requisite) . You will have to hurry because registration closes at midnight July 12. Go HERE for further information and to register. 2. Some of you may have already noticed that one of the more popular blog parties has begun. Karen Valentine of 'My Desert Cottage' organizes the 'Where Bloggers Create' blog hop and if you love snooping peeking into wonderful creative studios about the 'net, you will want to go HERE to check it out. Be sure to check out the links at the bottom of her post that will take you to visit the other blogs on the tour. It's fun!! 3. For those of you who like to crochet, perhaps you'd like to make yourself (or a friend) a pretty summer hat from one of the free instructions found HERE. 4. I also found a tutorial to make your own yarn bowl from polymer clay HERE. 5. 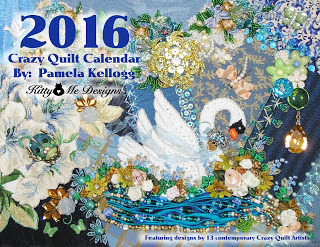 Pam Kellogg has released a sneak peek of her upcoming 2016 Crazy Quilt calendar featuring 13 wonderful designers. It will be available the first of September! I, for one, can't wait to see it. Today I have a quote from Francis of Assisi...."He who works with his hands is a laborer. He who works with his hands and his head is a craftsman. He who works with his hands and his head and his heart is an artist"
1. If you are looking for ways to make your photographs of your quilts (but useful for many other things too) Sharon B's husband Jerry has written a nice article HERE. 3. Came across an interesting tidbit on Craft Gossip - crocheting on leaves (yes, real live leaves!). Go HERE. And, finally, here's your quote of the day, attributed to the infamous 'Anonymous'.... "I'm still hot - it just comes in flashes"
Last night I finished up another collaboration project that has been stashed in my sewing room for too long. This little baby quilt was started by my friends mother and she was unable to complete it. I finished the quilting (by machine) and put the binding on. Now the quilt will go back to her family to await the birth of the next baby. And....remember The Quilt-zzzzz? And that I had some block off-cuts left over?? Well....last night I laid them out to see how many I have and how big a quilt using them might be. Would you believe a twin?? So....all that fabric will result in THREE quilts (two kings and a twin). It's the project that never quits!!! To the right of the photo you might be able to see that I've laid out some charcoal 'bits' that will be sashing between the 7x12" blocks. Those bits are leftovers from the backing of the first Quilt-zzzz. Can't say that I'm not using every little bit of that fabric!! Now - once I make it, what on earth will I DO with it!!! Yay, Christine! Please send me your snail addy and I'll pop your package in the mail the first of the week. Today the quote is from Stanislaw J. Lec.... "When you jump for joy, beware that no one moves the ground from beneath your feet"
I've also been spending an awful lot of time putzing about with my family tree. My cousin has loaned me a bunch of old family photos so I've been scanning and printing them for my records. This is my great - grandmother. dress in the summer time!! I came across something that some of you might find useful....if you go HERE there are number of size charts for all sorts of things available. Be sure you scroll down because there are lots of them! I also came across an interesting article regarding pricing your creations to sell and that can be found HERE. AND - Pam Kellogg has released a sneak peek of the cover for the autumn issue of the 'Crazy Quilt Quarterly' magazine and you can see that HERE. 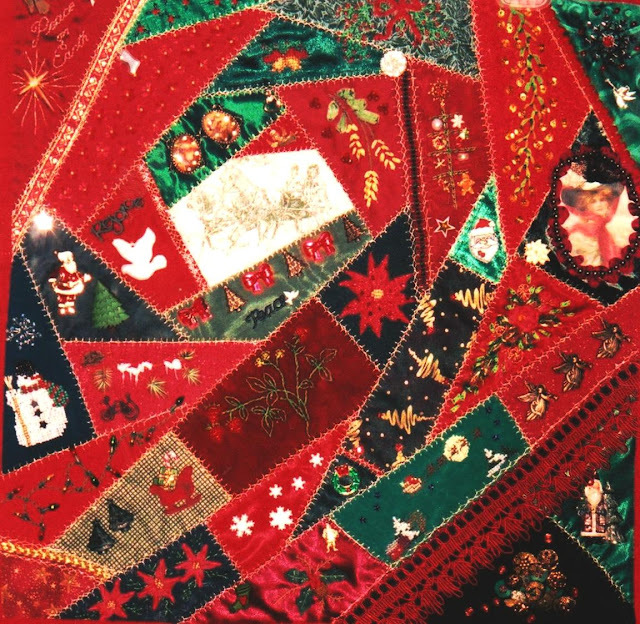 She has also put out the call for winter or Christmas themed crazy quilt pieces and articles for the Winter issue and you can read all about that HERE. Please do consider submitting photos of your work and also any how to's or articles - the magazine is only as good as you help us make it! Today the quote is from Theodore Roethke...."Deep in their roots all flowers keep the light"